Immerse yourself in the local culture of South East Asia and discover the spectacular sights, delectable cuisine and rich history of Vietnam and Cambodia, on an unforgettable 16 day journey from Hanoi to Siem Reap. From energetic cities to serene countryside, unique waterways to impressive temples and pagodas, the charm of Vietnam is legendary, as is the hospitality of those who call it home. In the north, the graceful capital of Hanoi, the mountainscapes of Sapa and the glittering beauty of Ha Long Bay await. On the central coast, Hue and Hoi An hold ancient appeal. Down south, bustling markets play out against a contrasting backdrop of French colonial architecture and skyscrapers in Saigon. In Cambodia, a world of iconic landmarks and ethereal beauty is waiting to be discovered. Once the Paris of the East, Phnom Penh’s Royal Palace and Silver Pagoda have retained their magnificence despite the region’s war-ravaged past. In Siem Reap, it’s easy to lose yourself in ancient history at Angkor Archaeological Park when wandering the many famous temples, scrambling over their stepped walls for a closer look. Along with exploring new cultures, one of the great joys of travel is the discovery of new cuisines. Those unfamiliar with Vietnamese food are in for a treat, as the national cuisine is flavorful, colorful and extremely healthy. 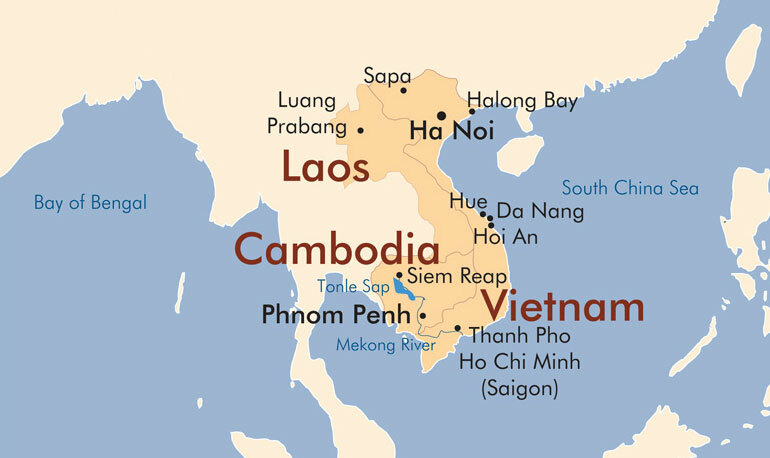 Northern Vietnam has long been influenced by its proximity to China. As the only part of the country that experiences four seasons, many dishes are only available on a seasonal basis. Overall, the food tends to be milder and lighter than that found in the rest of Vietnam. The pundits claim that central Vietnamese cuisine is the most culturally authentic food in the country. Heavily influenced by the imperial court cuisine of Hue, the food is generally spicy and well-seasoned. Southern cuisine is the most varied of the three. Rich in vegetables, rice and seafood, it has incorporated French, Cambodian and Thai influences into a style that is distinctively its own. It is generally more heavily seasoned, tropical and spicier yet sweeter than northern food. Being geographically located in the tropical zone, Vietnam is truly a heaven when it comes to fruits. One who first comes to the country will be amazed at the countless number of colorful fruits sold at a very reasonable price in every street and market all year round. Southern Vietnam is the largest fruit granary of the whole country, since the region’s weather is warm with long hours of sunshine, high average temperature and humidity year round. So before you leave the country, make sure to try the mangosteen, cherimoya, lychee, rambutans, longan, dragon fruit, sapodilla, jackfruit and maybe the durian. Imagine a city where the exotic chic of old Asia blends with the dynamic face of new Asia. Where the medieval and modern co-exist. A city with a blend of Parisian grace and Asian pace, an architectural museum piece evolving in harmony with its history, rather than bulldozing through like many of the region’s capitals. Hanoi is where imagination becomes reality. A mass of motorbikes swarms through the tangled web of streets that is the Old Quarter, a cauldron of commerce for almost 1000 years and still the best place to check the pulse of this resurgent city. Hawkers in conical hats ply their wares, locals sip coffee and bia hoi (beer) watching life (and plenty of tourists) pass them by. Witness synchronised t’ai chi at dawn on the shores of Hoan Kiem Lake while goateed grandfathers tug at their wisps over the next chess move. See the bold and beautiful dine at designer restaurants and cut the latest moves on the dance floor. Hanoi has it all: the ancient history, a colonial legacy and a modern outlook. There is no better place to untangle the paradox that is modern Vietnam. The Queen of the Mountains, Sapa sits regally overlooking a beautiful valley, lofty mountains towering over the town on all sides. Welcome to the destination in northwest Vietnam, gateway to another world of mysterious minority cultures and luscious landscapes. The spectacular scenery that surrounds Sapa includes cascading rice terraces that spill down the mountains like a patchwork quilt. The mountains are often shrouded in mist that rolls back and forth along the peaks, offering tantalising glimpses of what lies in wait on a clear day. The valleys and villages around Sapa are home to a host of hill-tribe people who wander in to town to buy, sell and trade. Sapa would be of considerably less interest without the H’mong and Dzao people, the largest ethnic groups in the region. The billowing red headdresses of the Red Dzao are visible all over town, a surreal sight amid the accelerating development. The H’mong are more numerous and canny traders. Their villages may look medieval but most will have a mobile phone and an email address to stay in touch. Traditionally, they were the poorest of the poor, but have rapidly learnt the spirit of free enterprise. Most of the Montagnards have had little formal education and are illiterate, yet all the youngsters have a good command of English, French and a handful of other languages. Majestic and mysterious, inspiring and imperious: words alone cannot do justice to the natural wonder that is Halong Bay. Imagine 3000 or more incredible islands rising from the emerald waters of the Gulf of Tonkin and you have a vision of breathtaking beauty. Halong Bay is pure art, a priceless collection of unfinished sculptures hewn from the hand of nature. In 1994 it was designated a World Heri­tage site. Visitors can’t help but compare the magical, mystical landscape of limestone islets to Guilin in China and Krabi in southern Thailand, but in reality Halong Bay is more spectacular. These tiny islands are dotted with beaches and grottoes created by wind and waves, and have sparsely forested slopes ringing with birdsong. Beyond the breathtaking vistas on a boat cruise through the bay, visitors to Halong come to explore the caves – some of which are beautifully illuminated for the benefit of tourists – and to hike in Cat Ba National Park. There are few real beaches in Halong Bay, but Lan Ha Bay (off the coast of Cat Ba Island) has more than 100 sandy strips. If art and architecture matter more to you than beaches and beer, Hué will be high on your Vietnam must-visit list. The capital of the Nguyen emperors, Hué is packed with temples, tombs, palaces and pagodas – or at least the remains of those that successive armies didn’t manage to completely destroy. Foodies won’t want to miss the fussy degustation-style Imperial cuisine for which this city is rightly famous. On the banks of the enigmatically named Perfume River, the peculiar light of this historic place imbues photographs with a hazy, purple tinge. Hue's complex history has earned it a reputation as a political, cultural and religious centre, but nowadays, visitors to contemporary Hue will find a city that only dimly reflects on its past, and only does so as a begrudging nod to its western visitors. Like Halong Bay to the north, the complex of tombs, pagodas and palaces throughout Hue and its surrounds has been designated a UNESCO World Heritage site. But to the Vietnamese psyche, shaped by centuries of war and struggle, tempered by nearly forty years of communist rule, this heritage is largely irrelevant and completely disconnected from the present. The overwhelming sense one gets from the city, on even the most casual visit, is of an unstoppable forward drive, and of a people constantly looking to the future. A highlight of any trip to Vietnam, Hoi An is a town oozing charm and history, having largely escaped the destruction of successive wars. Once a sleepy riverside village, it’s now quite definitely a tourist town – with hotels, restaurants, bars, tailors and souvenir shops dominating the old centre. Despite this air of irreality, Hoi An’s charisma pervades. Known as Faifo to Western traders, from the 17th to 19th centuries it was one of Southeast Asia’s major international ports. Vietnamese ships and sailors based here sailed all around Vietnam, Thailand and Indonesia. Perhaps more than any other place in Viet­nam, Hoi An retains a sense of history that envelops you as you explore it. This is especially true on ‘Hoi An Legendary Night’. Every month on the full moon, motorbikes are banned from the Old Town, which is transformed into a magical land of silk lanterns, traditional food, song and dance, and games in the streets. There’s plenty to do in Hoi An. Emphatically the most enchanting place along the coast, this is one spot worth lingering in. Fasten your seatbelts as Ho Chi Minh City is a metropolis on the move – and we’re not just talking about the motorbikes that throng the streets. Saigon, as it’s known to all but city officials, is Vietnam at its most dizzying: a high-octane city of commerce and culture that has driven the whole country forward with its limitless energy. It is a living organism that breathes life and vitality into all who settle here, and visitors cannot help but be hauled along for the ride. Saigon is a name so evocative that it conjures up a thousand jumbled images. Wander through timeless alleys to ancient pagodas or teeming markets, past ramshackle wooden shops selling silk, spices and baskets, before fast-forwarding into the future beneath sleek skyscrapers or at designer malls, gourmet restaurants and minimalist bars. The ghosts of the past live on in the churches, temples, former GI hotels and government buildings that one generation ago witnessed a city in turmoil, but the real beauty of Saigon’s urban collage is that these two worlds blend so seamlessly into one. Back in the 1960s, Siem Reap (see-em ree-ep) was the place to be in Southeast Asia and saw a steady stream of the rich and famous. After three decades of slumber, it’s well and truly back and one of the most popular destinations on the planet right now. The life-support system for the temples of Angkor, Cambodia’s eighth wonder of the world, Siem Reap was always destined for great things, but few people saw them coming this thick and this fast. It has reinvented itself as the epicentre of the new Cambodia, with more guesthouses and hotels than temples, world-class wining and dining and sumptuous spas. At its heart, Siem Reap is still a little charmer, with old French shop-houses, shady tree-lined boulevards and a slow-flowing river. But it is expanding at breakneck speed with new houses and apartments, hotels and resorts sprouting like mushrooms in the surrounding countryside. The tourist tide has arrived and locals are riding the wave. Not only is this great news for the long-suffering Khmers, but it has transformed the town into a pulsating place for visitors. Forget the naysayers who mutter into their beers about Siem Reap in the ‘old days’, now is the time to be here, although you may curse your luck when stuck behind a jam of tour buses on the way back from the temples. Arrive in Hanoi at 10pm. On arrival at Hanoi's Noi Bai Airport, we will greet and transfer you by private coach through the city to your hotel. ( Note: normal check in time for hotels is 14.00 ). Vietnam’s capital is a city of wide tree lined boulevards with tranquil lakes and colonial villa’s. Hanoi offers something for everyone and will leave you wishing that you had longer to explore this enthralling capital. Overnight at the hotel. After breakfast depart for an insider’s tour of the capital. Start with a tour of Ho Chi Minh complex with Ho Chi Minh mausoleum ( note: closed on all Mondays - Fridays ), botanical garden, memorial houses , One pillar pagoda…. From there, drive by vehicle to the Temple of Literature. In 1076 Quoc Tu Giam - Vietnam's first university, also referred to as Van Mieu ( in English is Temple of Literature ), was established within a temple to educate Vietnam's royalty, mandarins and members of the elite. 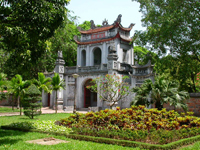 The university functioned for an incredible 700 years and its gardens and well-preserved architecture offer a fascinating glimpse into Vietnam’s past. Lunch time. After that, we will reach into the capital’s Old Quarter. This bustling area of narrow streets and alleys is home to literally thousands of small businesses and shopkeepers. It's a great place to explore with plenty of photo opportunities all around you. It is here in this area that lies the soul of the city, one the most ancient capitals of Southeast Asia. A mixture of village and old way of life amidst a modern and growing city offer amazing contrasts. 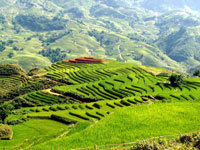 Arrive in the early morning in the border town of Lao Cai where it's a short transfer to Sapa. In the terraced hills and mountains of this area, the monotony of the expansive green landscape is enlivened by the colour of its hill tribe population. It is here you will find hands stained with colour from fabric dyes and shades of blue, red and green intricately embroidered and stitched into jackets, waistcoats, pants, skirts, caps, purses and leggings. Take a morning walking tour of Sapa for a visit to the busy market where Red Dao, Black Hmong & Flower H'Mong, Tay and other ethnic minority people converge from the surrounding countryside to sell their silverware and handicrafts, and to buy provisions. Afterwards, take a light trek to discover Sapa's quaint hill tribe villages. Opportunities for photographers to have nice photos about the panorama of rice terrace paddies, villages of the hill tribe people. In the morning, enjoy free time to discover Sapa at your own leisure. After lunch, we will visit the Silver Waterfall and then drive to Lao Cai and see the Vietnam - China international border gate. Have dinner and then check in at the train station for night train back to Hanoi. Arrive early in Hanoi. 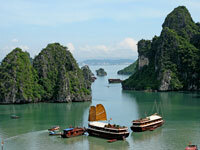 Have breakfast at the hotel and then leave Hanoi for an overnight boat trip on Ha Long Bay. Journey there through the rich farmlands of the Red River Delta, observe everyday life of Vietnamese villagers as they work the rice fields, take pigs to the market on bicycles and plough the fields with their water buffaloes. Arrive in Ha Long City late morning and board your traditional, private wooden junk for the overnight journey into the Bay. En-route lunch will be served. Following cruise by rock formations with such names as Sail, Dog and Dinh Huong (incense pot). Visit the floating villages. Towards the end of the day set anchor for the night. As the sun sets over the bay dinner is served on board with fresh seafood, salads, and fruits. For the early risers, join us for a Tai Chi session on the sun deck. Take an opportunity to view the sunrise over the Bay or have an early morning swim. Breakfast, coffee and tea and served. After breakfast we sail through the waters and pass by a number of caves including Trong (Drum) cave, Trinh Nu (Virgin) cave, Coc Ngoi (Toad ) cave and we drop anchor at Surprise (Sung Sot) Cave. Disembark and visit Surprise Cave located on Bo Hon Island. It is one of the widest grottoes in Ha Long Bay with thousands of stalactites and stalagmites. Take time to relax before checking out. Bags can be left in the luggage store. An early lunch is served around 11.00am. Return to the shore and disembark, say farewell. From Ha Long city, we drive to Noi Bai airport for flight to Hue. Lonely Planet describes it as "Palaces and pagodas, tombs and temples, culture and cuisine, history and heartbreak". After eating breakfast, we will head to Dai Noi (Imperial Citadel) where the Nguyen Dynasty ruled between 1802 and 1945. Afterwards, we depart for Thien Mu (Celestial Lady) Pagoda, which overlooks the Perfume River. Constructed in 1601, the 21 meter tower is the centerpiece of the pagoda and represents seven reincarnations of Buddha. On the pagoda grounds is the famous Austin car a resident monk drove to Saigon in 1963 to protest against the southern regime. The photo of his self immortalization is one of the most well known images of the war. In the afternoon see the tomb of the former emperor, Tu Duc, which is located in a tranquil setting of gardens and ponds. After breakfast, we depart for Hoi An via the wonderfully photogenic fishing village of Lang Co, Pass of Ocean Clouds, Da Nang city, Marble Mountain. When we arrive in Hoi An, we will have lunch before checking into the hotel. In the afternoon, you can discover Hoi An on your own. Despite the passing of 200 years and the ravages of weather and war, the centre of Hoi An remains much the same as it was in its heyday. A walking tour is the best way to see this marvelous town. Browse for souvenirs in Hoi An's art galleries and silk shops, or maybe cycle to the nearby Cua Dai Beach. A full day free to explore our third World Heritage Site. This historic trading town's architecture is a mixture of Japanese, Chinese, French, European, and Vietnamese. British, Dutch, American, Spanish, and Indian traders are just a few who stopped here to trade for silk fabrics, porcelain, mother-of-pearl, tea, and you name it. You might want to stop in one of dozens of tailor shops to get them started on a suit or some shirts. Hoi An is often referred to as the Honeymoon Capital for its picturesque beauty. You can relax on the beach, go shopping, or visit some the historic buildings. Try the Tan Ky House, the Fu Kien Assembly Hall, or the Japanese Covered Bridge. You will have some free time in the morning to explore Hoi An by motorbike, bicycle, or cyclo tour. Check out at noon and depart for Da Nang Airport for the flight to Ho Chi Minh City. 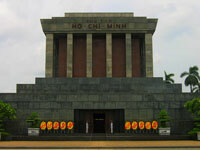 Depart the hotel for a full day Ho Chi Minh City tour. Head to the Chinatown district, to discover the area’s markets, shops, and the Cantonese Thien Hau Pagoda - dedicated to the goddess of the Sea. Visit Vietnam's first traditional medicine museum, the FITO Museum, with an amazing collection of 3,000 items relevant to the development of traditional Vietnamese medicine. Head back to the city centre to visit Ben Thanh Market where an incredible display of fresh produce is offered. Simply stroll through the market exploring the variety of goods for sale. In the afternoon, visit the the former Presidential Palace, stroll to the major sights of colonial Ho Chi Minh City, the Old Saigon Post Office, Dong Khoi Street (formerly Rue Catinat), Continental Hotel, Opera House and City Hall. Travel to the outskirts of Ho Chi Minh City to visit the unusual Cao Dai Temple at Tay Ninh and explore the historic Cu Chi Tunnels. Drive through the countryside to the colorful, whimsical building which is home to the eclectic Cao Dai religion. Journey from here to Cu Chi Tunnels, an incredible network of 250 km underground tunnels constructed by the Vietnamese resistance fighters during the French and American wars. Transfer to Tan Son Nhat airport to catch the flight to Siem Reap. We’ll visit the beautiful Great Tonle Sap Lake, the largest lake in Southeast Asia. After taking in the rice paddies and local way of life to reach the water’s edge, we will transfer to our boat and proceed to sail through mangroves, visit floating and stilted villages, and experience a fascinating, traditional and unique way of life. This lake with an area of 16000 square kilometers during the height of the wet season is an astonishing place, so significant to Cambodia and Southeast Asia as a whole, and it’s home to great number of rare species of wildlife and some of the most resourceful communities on this earth. On our way back to Siem Reap we shall visit Wat Athvea, a little known 12th century temple set in a riverside village. Silent except for the occasional chanting of monks and birds, Wat Athvea is an elegant temple set in these peaceful and serene surroundings. We commence with a visit to the infamous and treasured legacy of Angkor Wat. The masterpiece and holy grail of the temples of Angkor, Angkor Wat is the world’s largest religious building and an insurmountable legacy left by Suryavarman II. Believed to be the world's largest religious building, there is almost one kilometer of exquisitely detailed carvings depicting the intricacies of the Khmer empire through dramatic and humorous stories of love, life, war, religion and mythology. Marvel at the quincunx of towers, and the powerful energy that this sublime temple inspires, and admire the carvings and architectural symmetry and perfection of the complex as a whole. We shall continue our visit to Ta Prohm. Of Tombraider fame, Ta Prohm is an Angkorian treasure, and it’s going to stay that way. A fascinating aspect to Ta Prohm (except for its size, beauty and pleasantly eerie atmosphere) is that it can be appreciated perfectly as it would have been a mere 900 years ago, as it has been ‘left as it was found’ by the French explorers who discovered it in the 19th century. Ta Prohm is a sight to behold, a veritable maze with exquisite carvings and gigantic golden trees strangling the stone foundations at every juncture. Lunch in Siem Reap. After lunch, we will explore Angkor Thom. Known as the ‘Great City’, Angkor Thom was Jayavarman VII’s ultimate creation, his true expression of design excellence. Angkor Thom was an entire city housing 150,000 people across nine square kilometers which thrived upon a complex system of agriculture and waterways. Five magnificent gates 23 metres high spiritually guard the complex - we will enter through the Victory Gate, complete with a causeway with two emanating rows of Devas and Asuras wrestling a powerful Naga. From here we will converge upon the centre of this extraordinary city, and begin to explore, starting with the Elephant Terrace, a royal platform used as a viewing gallery for grandiose royal spectacles, decorated wonderfully with statues of elephants. Adjacent is the Terrace of the Leper King, unique for possessing the statue of Yama (the Leper King), god of Death. From here we will proceed through the forest to Preah Palilay. Guarded by a large Buddha this is a small but beautiful temple from the 13th century. Afterwards we will proceed to Phimeanakas, a 10th century largely uncarved but beautifully constructed pyramid temple affording terrific views, before Baphuon, an imposing 50 metre tall temple dedicated to Shiva which houses one of the world’s largest reclining Buddhas. And finally to Bayon, arguably the most stunning of all the Temples of Angkor, adorned with 37 towers decorated with wonderful giant stone faces and beautifully decorated carvings throughout. Finally we will proceed to Srah Srang, a stunning man-made lake used by kings of old for bathing, irrigation and leisure where we will stop at a gorgeous spot to appreciate the sunset. We will head out 45km from Siem Reap to Kbal Spean. Set within beautiful Cambodian countryside and a popular place for the locals to enjoy family picnics, Kbal Spean, also known as the valley of the 1000 lingas, is a remarkable place where natural meets man-made phenomenon – 1000 hand carved lingas lie on the bed of the Kbal Spean River downstream from the stunning waterfall, believed to have been placed there in ancient times to fertilize the river. Lunch at a local restaurant. We will then proceed to Banteay Srei 30km from Siem Reap, a unique and exquisite temple, glowing red and in perfect symmetrical detail, which possesses a truly unrivalled beauty all of its own. The carvings here are undoubtedly the most detailed of any of those in Angkor, and the perfection and attention to detail are remarkable. Then on our return to Siem Reap we shall visit Preah Khan, an immense creation from the prestigious king Jayavarman VII, dedicated to his father, before stopping at Srah Srang – a vast and beautiful man-made lake where the Royals of Angkor would bathe, relax and unwind, for what is usually a breathtaking sunset. Tranfer to airport for flight home at 10:00pm. We have procure the following group airfare. If you are interested in booking your own airfare, please let us know. You will be purchasing your group airfare directly from our contracted travel agent. This purchase can be made via credit card. The airfare ticket is refundable, but you will be subject to a penalty of $185. We will provide you with the details when the airfare payment is due. The deposit for this international trip is $400. Full payment is due by September 1, 2013. Cancellation charges reflect the many expenses Friendly Adventures cannot recover if you cancel, even if you must do so due to illness, injury, or personal emergencies. These fees are not meant to be punitive in any way. The charges made reflect the expenses Friendly Adventures has incurred in administering your reservation and planning for your participation. We recognize that the majority of those who cancel their reservations do so out of necessity. Please note that we do not make any refunds for any unused portion of your trip, not arriving, arriving late, or leaving the trip early. In the unfortunate event that you must cancel your trip, your land package refund will be determined according to the formula below. Friendly Adventures reserves the right to cancel or alter a trip due to unforeseen weather, unsafe conditions, low registrations or other circumstances. On the rare occasion when Friendly Adventures must cancel a trip, all payments received to date will be refunded, including the non-refundable portion of your deposit. Friendly Adventures is not responsible for expenses incurred in preparation for any canceled trips, including airplane tickets. WE STRONGLY RECOMMEND TRIP CANCELLATION/TRIP INTERRUPTION INSURANCE, WHICH COVERS YOUR COST IF YOU NEED TO CANCEL OR INTERRUPT YOUR TRIP for medical reasons, trip delay, lost baggage, and other unforeseen emergencies. Friendly Adventures will send you information about travel insurance with your registration information, or you may purchase coverage through your own insurance company. In order to avoid disappointment and expense in the event that you must cancel your trip we strongly urge you to purchase some type of insurance coverage. Send an e-mail to the organizers.